Refugees and asylum seekers from a hosting and reception center in the Italian city Caserta received training at a well-known Neapolitan pizza place in nearby Naples. The course was part of an initiative called "Pizza against racism." ''I used to work as a chef, but I had never made pizza before'', says Ouattara, a 30-year-old Ivorian national who lives in Caserta, a city around 200 kilometers south of Rome. He gets training from the local SPRAR center that provides accommodation and assistance to migrants in the southern city. ''Now I have learned, the best one I make is Margherita (pizza) and my dream is to go back to the Ivory Coast one day to open my own pizza place." Ouattara, together with two other migrants, followed a course for pizza chefs at the pizzeria Nello in downtown Caserta. 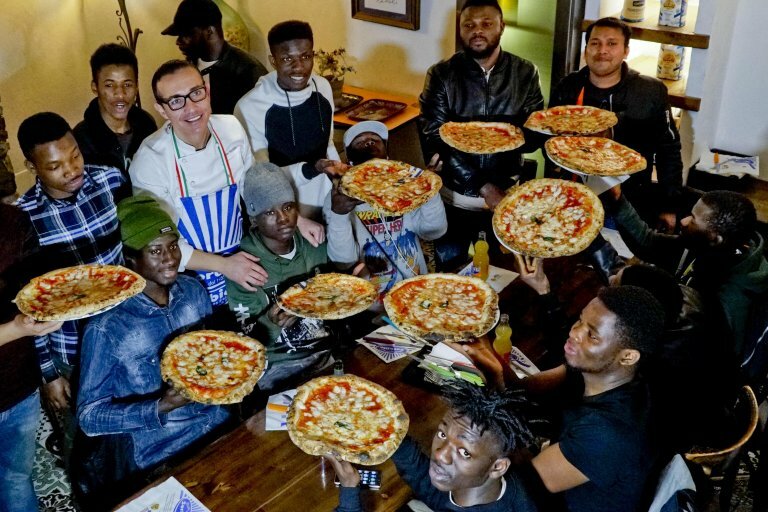 As part of the special project "Pizza against racism", Ouattara together with other pizza chefs and a group of 20 migrants from the local SPRAR, was invited to take part in a training at Gino Sorbillo's pizzeria, one of Naples' iconic pizza places. The owner, Gino Sorbillo, said he was contacted by the head of the SPRAR for the project ''to give a welcoming sign, one of openness and sharing, here in the historic center of Naples that is going through a very difficult phase." Sorbillo said that the area was becoming "difficult" and that prejudice and violent acts have been reported. "I hope this will be the first of a series of meetings and exchanges of friendship." ''I stand up for this and give them a great welcome, my place is open to everybody, to all cultures and skin colors'', said Sorbillo. Thanks to the course, one of the three migrants who trained at the Caserta pizzeria found a job: Opuko Hayford, from Ghana, will be hired by Nello. ''I went to Norway, then Germany but I found a home here and now a job'', he said. ''I respect tradition but I would also like to innovate taste." The trainees also pitched some ideas. "Together we thought about different tastes, including those that are close to their gastronomic culture," said Nello, who owns the pizza place in Caserta. We are "experimenting and have thought about a sweet fried pizza, with the filling of sfogliatella," a local pastry, he added. And while migrants are learning the art of Neapolitan pizza-making, which UNESCO put on its prestigious Intangible Cultural Heritage list, Nello is working to involve more local pizza makers to teach migrants their trade. "We are working on it," everything takes time, he said. Nello said that his clients were initially wary when they saw the migrants make pizza "while now they appreciate them and have become friends." Nevertheless, youths assisted by the local SPRAR, as well as many immigrants, are still facing problems, said Mamadou Sy, the spokesman of the Senegalese community in Caserta. ''The government needs to give a sign of help. There are thousands of youths that have a humanitarian residency permit but they are afraid. We must give these youths the possibility of working, of being able to sign an open-ended contract because there is demand. Without regular permits, they will be exploited by unscrupulous employers."